How to determine shear? Wind shear is always present. Determining how much there is will improve sail trim and performance, and offer a clue about future wind shifts. Shear is best determined by tacking upwind in full racing mode. Shear is half the sum of true wind angle on the two tacks. When shear is present, boatspeed and heel angle will be lower on the tack in the direction of the shear, and higher on the other tack. This confirms that it’s shear and not sensor alignment. You can also use the ‘ShearOmometer‘ before you go sailing. (The following example uses the readings shown in the figure). Shear is +5º. (52º+(-42º))/2=+5º. Plus means to the right. Boatspeed is down 0.25 knots on port tack and up 0.25 knots on starboard, as would be expected for positive shear. Mean boatspeed is 7.02 which is 0.10 knots below target. This is probably due to a combination of less efficient sailplan due to shear, and higher than average gradient. In any case, you know that your new targets will be down 0.10 knots, modulated by 0.25 knots due to shear. Effective wind direction is 225º as determined from heading on the two tacks. 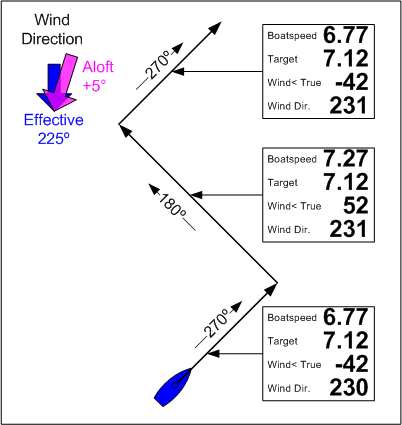 Note that wind direction is 5º right of your effective wind direction, and doesn’t change tack-to-tack because of shear. Note: The T1 automatically determines and displays shear (see Stats). It is very important to determine shear, targets and sail trim before the start of the race, so the information can be used right off the line. Since shear tends to predict future wind, it offers a clue about which side of the fleet to favor. This could be trumped by local knowlege. This is also a good time to get an idea about how shifty and puffy the wind is. Shiftyness will affect your decision about how conservatively to call the layline (see Approaching the Mark). On the windward legs, shear and targets should continue to be monitored for changes.